For the rest of us, Syndicate is possibly the landmark Bullfrog title. People still rave about Syndicate, even today, and it’s pretty easy to see why: it’s the first thing1 they made that was expressly designed as a game first rather than a system. Populous made the mistake of the system being the game, which is why the reaction to it today is… well, it’s pretty much the one I had when I wrote the last one of these; it’s acknowledged as a remarkable technological achievement but there’s a rather lukewarm reaction towards actually playing the thing. Syndicate still has the open world, autonomous system that all the Bullfrog games are known for, but it stands in stark contrast to Populous by making this system — the city environment — a backdrop for the player’s actions within it rather than the be-all and end-all of Syndicate itself. Sitting on top of the city is something that is very explicitly game-y: a squad of four cyborg agents ordered around the streets with the left mouse button and who will gun down anyone sitting under the mouse cursor given a cue from the right mouse button. 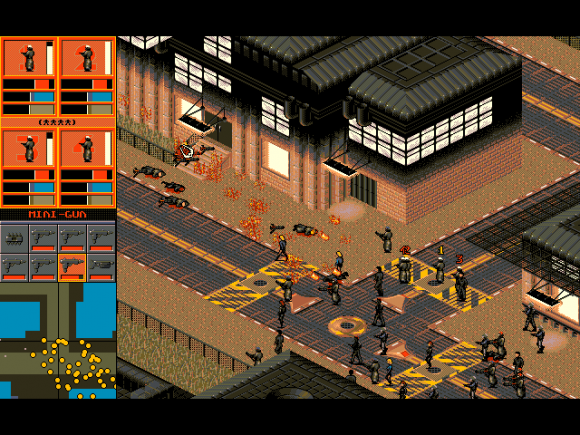 Each mission in Syndicate has a concrete objective — assassinate this target, persuade that target, eliminate all rival syndicate agents in the city — but doesn’t tell you how you should be going about it; instead it just dumps your agents into the mission city, gives you a target marker and leaves you to get on with it. These days this seems like a pretty token amount of structure for a game, but it did wonders for Syndicate’s coherency when compared to Populous. Syndicate isn’t anywhere near as open or sprawling a game as Populous, but that’s a good thing; the bits it cut were fairly flabby and abstract anyway, and what’s left is a pretty focused experience that plays very well to its theme, rather than the theme being an ill-fitting mask for an already-existing system. For example, rather than having Syndicate’s fifty levels be a simple linear progression from one to another, Bullfrog made the effort of contextualising each level by presenting it as a region on the world map. By completing the missions you gradually spread the stain of your syndicate’s colour across the globe, and — importantly — there’s a limited degree of choice given to the player as to which mission they attempt next, as any region that’s adjacent to territory you control will be open for a takeover. There’s also a point to doing the missions that goes beyond “You have to in order to finish the game,” since each region you take over pays tax that funds your R&D labs’ efforts to develop new and better ways of killing people. The R&D portion of Syndicate would probably be considered pretty basic today – aside from improved body modifications for your agents there’s maybe twelve things to research, half of which are pretty useless — but it nevertheless provides an invaluable sense of progression to Syndicate. The body mods are expensive as hell to both research and install, but they provide your agents with dramatic performance boosts, making them faster, more resilient and more accurate. An agent with only Level 1 arms will spray lead all over the place when firing his Minigun, wasting ammo and increasing Time to Kill2, but the same agent with Level 3 arms will fire every single bullet dead-on to the spot where you point your mouse cursor. As for the weapons, the blind research in Syndicate (you can only direct your efforts into one of four very vague research areas) allows you to work your way from basic pistols and shotguns to Uzis, and then to Miniguns, and then to lasers and the infamous Gauss Gun — these days we take the term “Gauss gun” to refer to magnetically accelerated weaponry, but in Syndicate it’s just a fancy name for an immensely destructive rocket launcher. Like most games there’s a point where you have so much money that it ceases to mean anything, but for the first two thirds of Syndicate fully outfitting an agent with the cutting edge in weapons and cyborg implants is ruinously expensive, which in turn makes your otherwise faceless stooges investments to be protected. They’re still expendable, mind. Replacing dead agents is a setback, but it’s a price you might end up paying given how violent Syndicate’s combat is. I’m actually a little surprised there wasn’t more of a GTA-esque outcry over it at the time since it inevitably involves the wholesale slaughter of civilians by the dozens. It might be entirely inadvertent, but unless you’ve upgraded your agents with the maximum Arms tech the spread on their weapons means they’re going to catch passers-by in the hail of lead they unleash when they return fire on enemy agents. Because the weapons do include flamethrowers and rocket launchers it’s kind of hard to discriminate when hordes of trenchcoated cyborgs are throwing themselves at your beleaguered team; the wandering-around-on-fire-screaming animations seem a little tame today, but 10 year-old me was very impressed with them at the time. And that’s without even getting into the thing most people remember Syndicate for: using the Persuadertron to press-gang the city’s population into your own private army. The Persuadertron seems like one of the leftovers from Populous that went very, very right. It’s a magic doodad that brainwashes anybody standing near your agents to your side; basic civilians are converted instantly, while guards, police and enemy agents require a successively greater critical mass of already-converted personnel, but if you have the Persuadertron equipped sooner or later you’re going to be trailing a crowd of converted citizens behind you. These citizens are unswervingly loyal: armed citizens such as the police will fire their weapons at targets when you do, while unarmed civilians will go so far as to arm themselves with weapons dropped by fallen enemies so that they can join in the shooting. They’ll suffer terrible losses if you get into any kind of serious battle, but each bullet they stop is one less that hits your agents. It feels almost like an afterthought that Bullfrog chucked in because it was a shame to have this living city environment that you could only really interact with by killing the population, but it’s one that reinforces the central theme of Syndicate: that life is cheap, and any amount of collateral damage is acceptable as long as you get the job done for your corporate pa ymasters. 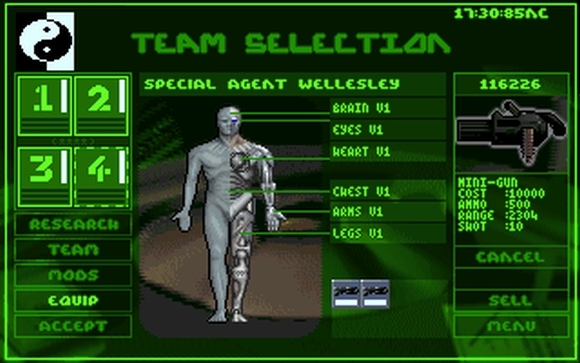 Syndicate is a great example of Bullfrog’s imaginative system design being properly harnessed into an actual game; by focusing down the gameplay from influencing an entire tribe to control of just four agents while compensating the player with a degree of choice on the strategic layer it comes across as a much more coherent experience than Populous, even today. It’s creaking a little bit these days – the UI, vehicles and inventory are all pretty painful to use– but I found it was still perfectly playable, and more than that, it was still enjoyable. Bona fide classic. I recall I got this as part of a ludicrously inconsistent four-pack when we replaced our broken Amiga 500 with a 1200. I think the other games were Brian the Lion, Kick Off 3, and Zool 2. Not sure who made the bizarre decision to throw in Syndicate with a pair of rubbish platformers and a football game, but nine-year-old Janek liked that person very much. 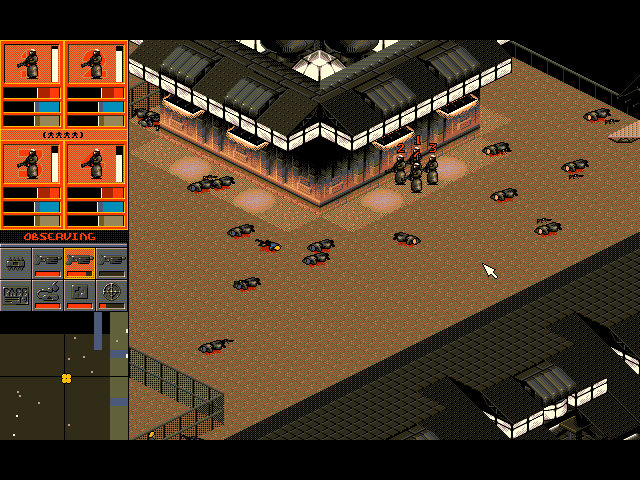 I would instantly buy a straight remake with modern graphics and interface – as seems to be the fashion these days. EA are missing a trick by letting Satellite Reign fill that niche. Paradox Interactive has the rights now and they were going to do something about it few years back but right now the project is frozen it seems.